To help you access the power of the Sun on Sun’s Birthday, Pillai Center will be performing Aruna Prasnam, also known as Surya Namaskara (Sun Salutation) Mantra Chanting followed by Six-Priest Grand Aditya Homa (Fire Prayer to Increase Your Life Force and Cure Diseases). Our expert priests will chant Surya Namaskara Mantra, the 132 hymns covering 32 passages from Thaittreeya Aranyaka of Krishna Yajur Veda. 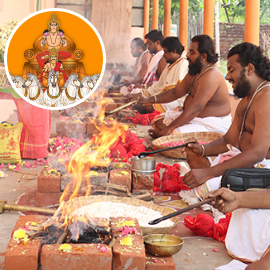 These melodious Vedic hymns are very effective when recited with the right pronunciation. 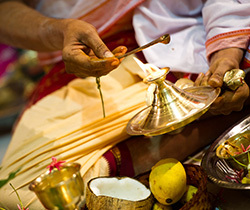 Performing these ancient Vedic techniques as per scriptures on Ratha Saptami day can destroy sins, dispel all doubts, alleviate worries, sorrow, anxiety, and anguish and can bless you with good health, prosperity, wealth, knowledge, positivity and all-around success. On this day, the Moon will be in the star Bharani, ruled by Venus. 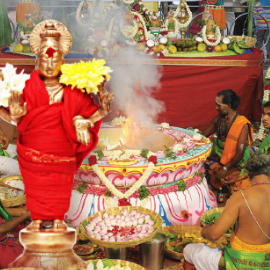 The son of the Sun and the god of death and Dharma, Yama, is the presiding deity of the star Bharani. The star lord Venus will be in the 9th house (House of fortune) from the Moon, making it an ideal day to seek blessings for good health, longevity, and vitality. Moreover, the Moon sharing the sign Aries with Mars helps to take the right action to go in a righteous path to lead a positive and progressive life. 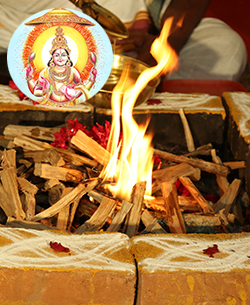 Performing Pooja to the Sun God at this special Powerspot can protect you from the adverse planetary effects, mitigate Saturn’s effects during the 7 ½ years and Sun Dasa (major planetary period) and Bhukti (minor planetary period) effects and attain all-around success. 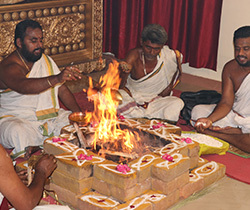 Trca Baskara Homa is a very rare sacred fire ritual, during which a special combination of three Rig Vedic mantras are recited. 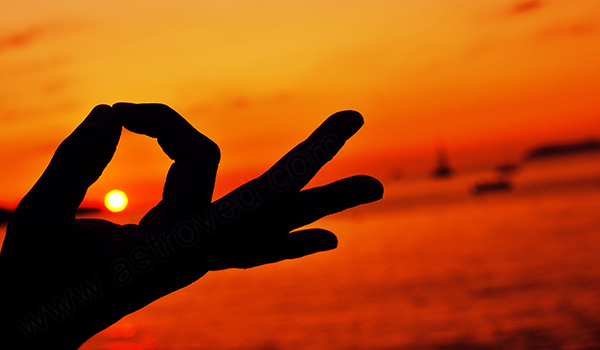 This fire prayer invokes the graceful blessings of the Sun God. 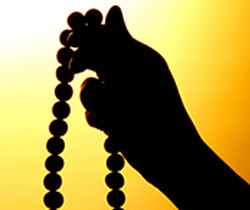 It can destroy sins, dispel negative forces and cure diseases, especially those related to the heart. When a Saptami (7th Moon phase) falls on a Sunday, it is called as Bhanu Saptami and is considered auspicious to worship the Sun God on this day. 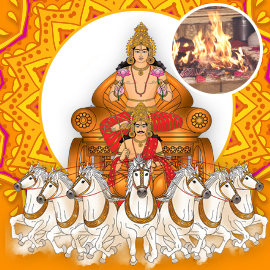 According to sacred texts, it is the day when the Sun Gods ascended with his chariot of seven horses. Chanting the sacred Sun mantra ‘Aditya Hrudayam’ on this special Moon phase can strengthen your heart and meditating upon it can grant you victory over enemies, longevity, wealth, knowledge, good fortune, and reduce anxiety. 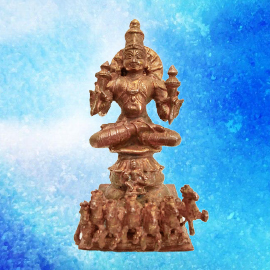 This Sun God with seven horses statue, energized in the Ratha Saptami power rituals can protect you with the graceful blessings of the Sun God. 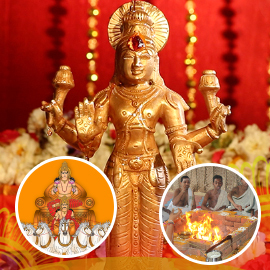 Keeping this statue on your sacred altar can bestow prosperity, wealth, knowledge, positivity, and all-around success.